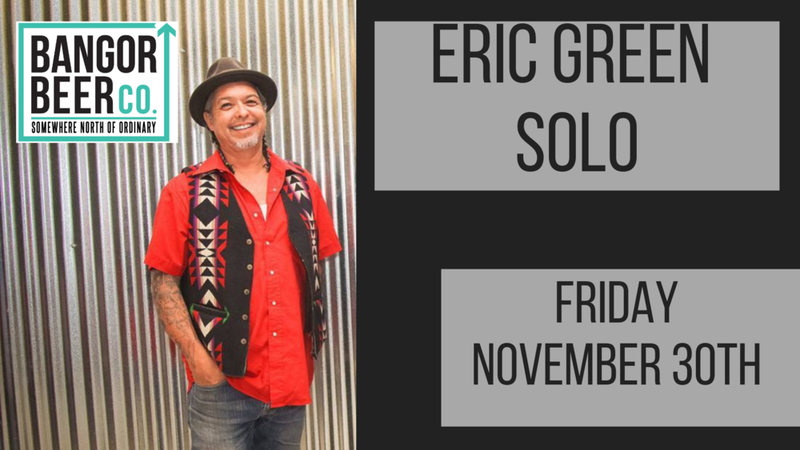 Eric Green is a solo roots and blues multi-instrumentalist.His performance will feature bottleneck slide, New Orleans piano as well as originals, and more! It's finally here! The Chocolate Oatmeal Milk Stout made by Dave Rocker that WON the Homebrewer's Competition. Come try it out before it's gone! We're tapping it Wednesday. Bangor Beer Co. Turns 1! We’re throwing a CAN JAM for our first birthday! Think - pinatas, beer, cake. As we come together for a day to celebrate our communities creative innovators & entrepreneurs that are working to bring forth more wealth and abundance for all people! The event will host a variety of vendors including but not limited to local farmers, jewelry makers, massage therapist, psychic reader, florist, etc. We will have speakers and leaders scheduled on topics and activities that raise awareness and personal achievement. Grab some props and snag one of our photographers for a memorable shot in front of our backdrop. Our featured artist Chris Braley will showcase his designs as well as present a live demonstration. There is even expected to be a freestyle spinning fire show! Participants will enjoy a Bangor Beer Co. beer or a glass of wine after a nice yoga session with instructor Geneva Gallant. We will all enjoy the sunset while ending our practice. This event is rain or shine under the tent. Our BBC twist on a fun night $2 Tacos, Trivia with prizes and Techno beats! 10% off for Husson/UMO / college students and associates welcome back! August 18, we celebrate the life of the one and only Elvis! We'll be playing all Elvis albums, and featuring Elvis Inspired Drinks and Beer, as well as serving Elvis' Favorite - Peanut Butter and Banana Sandwiches & Fried Bao Buns with Peanut Butter and Banana. We'll also have Prizes and Competitions including $25 gift card for best Elvis! We'll be giving away over $100+ in prizes, gift cards & merch! Maine Event Comedy presents Los Angeles transplant Brian Brinegar at Bangor Beer Company, Saturday, August 17 at 8:30 p.m. He’ll be joined by David McLaughlin, Mark Reilly, and host Mark Turcotte. Now residing in Gorham, Brinegar was thrice named Maine’s Best Comedian by the Portland Phoenix. He’s worked with Last Comic Standing winner Iliza Shlesinger and was featured on the Comedy Time Network. He’s also performed at the world famous Comedy Store in Los Angeles, the Ice House in Pasadena, and played the bartender in Toby Keith’s “I Love This Bar” music video. Reilly, who moonlights as a U.S. mail carrier, was a finalist in Portland’s Got Talent and recently performed at the Broken Record Show in the Wild West Comedy Festival in Nashville Tennessee. McLaughlin hails from Somerville, Mass. He’s a regular at the Comedy Studio and was selected to the 2018 Salem Comedy Festival. Turcotte performed at Gotham Comedy Club in New York City and was a recent selection to the Boston, Cleveland, and North Carolina comedy festivals. Bangor Beer Company and Queen City Athletics have partnered together to provide the area's first BREWERY BOOTCAMP! We have combined two of the best things Maine has to offer – an awesome exercise environment and GREAT beer! A Brewery Boot Camp is built on the idea that “you can not be physically fit, if you are not mentally fit”! Meaning that if you can’t enjoy a good beer (or treat) every once in a while, maybe it’s not worth it. A Brewery Boot Camp workout is designed for people of all fitness levels. You can be a seasoned athlete or just getting started on your workout routine. Boot camp instructors will be providing a high-quality total body workout in a non-intimidating and friendly atmosphere. Where people can come together, break a sweat and enjoy a beer with new friends afterward. For tickets, head to our facebook page! Join us we fuse beer, civic engagement, and the environment at Bangor Beer Co. with FUSION:Bangor on Tuesday, August 14th from 5-8pm! Come learn what BBC and Fusion are doing to make Bangor better. Bangor Beer Co. will be featuring their fresh beers that we hear are somewhere north of ordinary and offering tours of their brewing facility. Weather permitting, *fingers crossed* we'll be enjoying their brand new beer garden complete with a fire pit, corn hole, and a dome jungle gym (presumably for those well under 21). Welcome to the Maritimes, Eh! Five of Atlantic Canada’s best young comics are headed to Bangor Beer Co. for a night of rapid-fire, no-jokes-barred comedy, Saturday July 20 at 8:30pm These comics have blown the roof off of venues all over Canada and are looking to move up to the big leagues: the U S of A. With festival appearances and gigs from the Saint John Lions Club to The Rivoli in Toronto, these up-and-comers are making their mark on comedy wherever people will have them. And lucky you, they’re coming to Bangor next! I'm Steve Fudge. 4 years doing stand-up in Canada and the US. My umbilical was a mic cord, so I feel at home on a stage. I have over an hour worth of material without tackling mommy issues. I've graced the stage at Chuckles and Yuk Yuks in Saint John and opened for Chris Quigley and Jimmy Kimmel guest Casey Crawford. Recently headlined Wilsor's Room in Fredericton. I still have my original forehead. Sam Laidman is an up and coming comic with a sharp wit and dumb face. He is a self-deprecating shut-in skilled at making the mundane hilarious. He has been doing stand-up for two years. He is from Saint John. He likes eating, drinking, and sleeping. Sam Laidman was on TV once. It was snowing and the news asked him about the snow. 2007 peewee hockey champion. Was healthy scratch in playoffs. Born in Hamilton, Ontario, Canada. Once photosynthesised an entire meal. Brian Godsoe is a staple of the New Brunswick comedy scene. He has performed all over the maratimes as well as Calais and Boston. He has opened for Nikki Payne, Ron Vaudry, Mike Dambra and many others. He also once mistakenly thought the guy on the Canadian tire money was the king of Canada and he lives there! I’m Chris Hovey. I hate when people ask me for a bio. What am I supposed to say? I’m rate funny, subconscious of my slopey shoulders and started comedy on a lark and people keep asking me to do it so I keep doing it.